This week, Xur is on Titan. 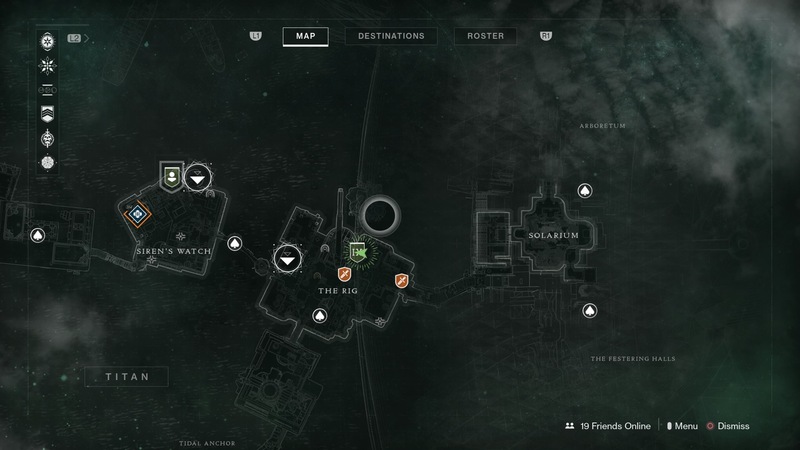 Fast travel to The Rig and head left to find Xur just inside one of the rooms. You’ll have to drop down a couple of levels as you head towards him. You can mark his location on your map. This week, Xur is selling the Riskrunner SMG for 29 shards. The Lucky Pants Hunter leg armor is available for 23 shards. You can get the Doom Fang Pauldron Titan arms for 23 shards. And finally, the Wings of Sacred Dawn Warlock chest armor for 23 shards. Xur also sells a Fated Exotic Engram for 97 shards, and a Three of Coins consumable for 31 shards. The Riskrunner submachine gun is one of the exotics that you are able to choose during the story, so you may already have your hands on it. Whenever you take any arc damage, the gun’s power increases as well as chaining the lightning to nearby enemies and returning ammo to the magazine. In some instances this can provide near infinite ammo with increased damage output, especially great for taking on Fallen enemies who have arc attacks and on Nessus, where the radiolarian fluid causes arc damage by standing in it. I would highly recommend picking this one up if you don’t have it. Lucky Pants increases Hand Cannon ready speeds and ups the initial accuracy. While Hand Cannons aren’t currently in a great place right now in Destiny 2, these can help make them a little more viable. With new weapons and a new sandbox balance update coming in just over a week, it might be worth picking these up just to prepare for the possibility that they become really useful. The Titan’s Doom Fang Pauldron makes shield bash melees recharge the Sentinel’s shield throw. Pair this with the bottom skill tree where you get two shield throw charges and you’ll be a regular Captain America. It has the bonus perk of melee ability kills recharging the Sentinel’s super as well. Wings of Sacred Dawn will hold Warlocks suspended in the air when they aim down sights, with precision hits extending the duration. Dawnblade needs to be the equipped subclass for this perk to function, so if you tend to run anything else, this chest piece might be useless to you. The Fated Engram is limited to one per account per week, and guarantees an exotic item that you haven’t yet gotten. The Three of Coins consumable will increase the chance for exotic engram drops from all sources for four hours. A single consumable costs 31 shards. Last week, Bungie released the second half of their big December update, and The Dawning event started this week. Bungie also released a Destiny webcomic, which we reviewed. It has a secret code in it for an emblem in Destiny 2. We’ve also got a series of Destiny 2 guides, including an endgame guide for after the campaign, a step-by-step Raid guide, and a guide on how to trigger all heroic public events.